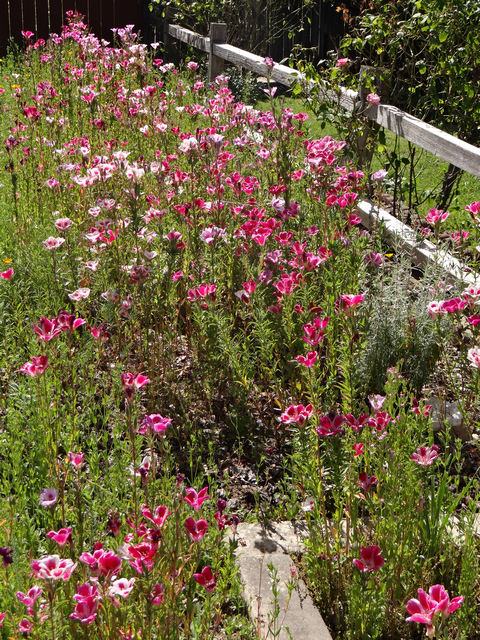 It's absurdly late to be posting these pictures; the garden no longer looks anything like this. Most of the plants pictured here are no longer blooming, some are completely dormant and leafless, and a few are dead, the victims of the same neglect on my part that prevented me from getting around to posting these pictures. What can I say? It's been an extremely stressful summer. I've been working impossibly long hours for many, many months, and nothing else has gone very right either. 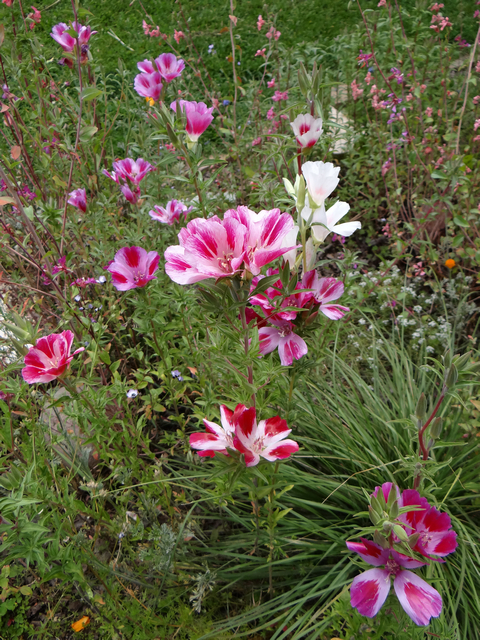 But I want to catch up on posting my garden pictures, so here are the ones from June. I hardly managed to take any in July because July was so horrible, so I mostly have just August and September left to catch up with. 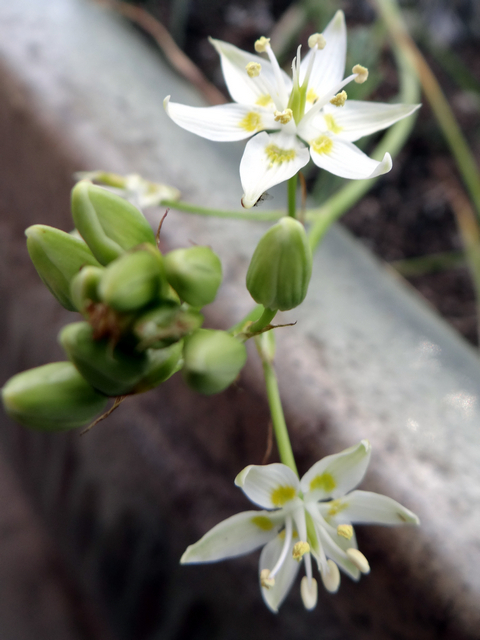 The plant I got most excited about in June was death camas (Zigadenus fremontii). 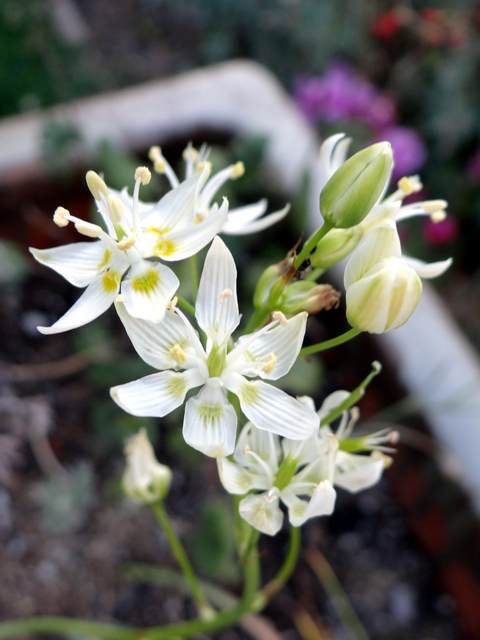 Its intimidating name comes from the fact that when not in bloom, it closely resembles camas (Camassia quamash), a bulb that the indigenous Nisenan people regularly dug up and ate. 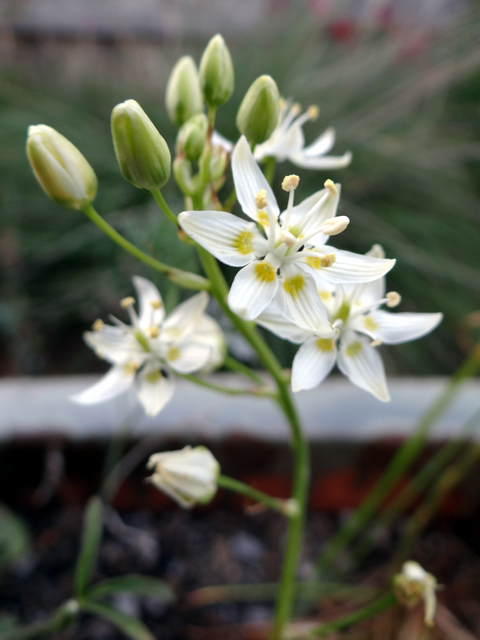 Death camas is also a bulb, but if you mistake it for camas and eat it, it can kill you. 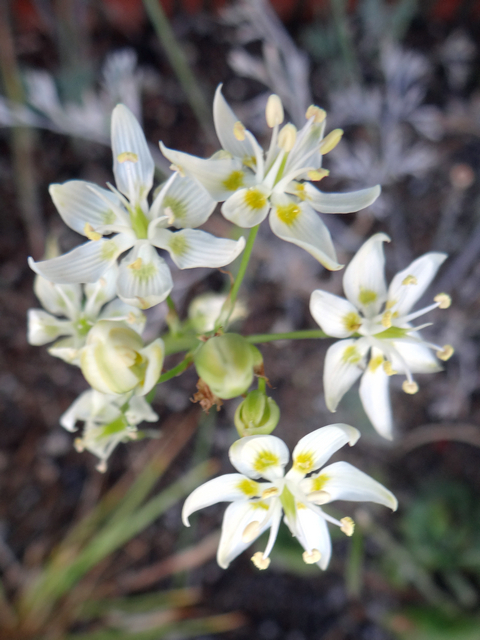 So if you decide to forage for California native bulb to eat, make sure you don't get any death camas mixed in with your camas. 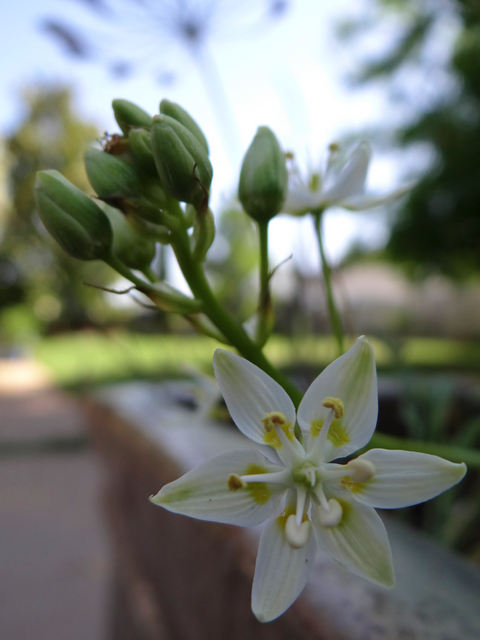 As long as you don't eat it, death camas is perfectly harmless. 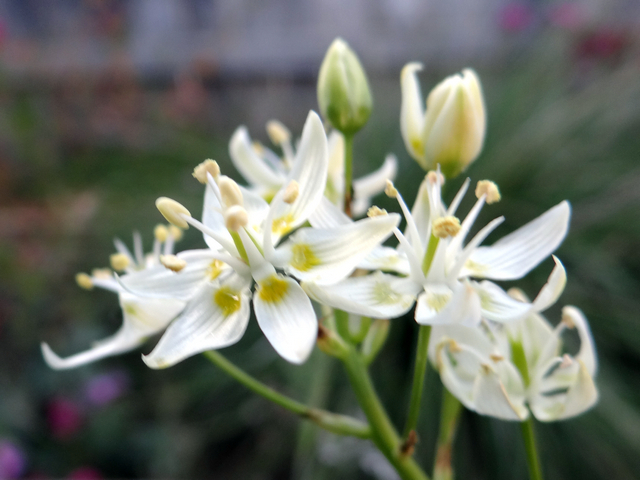 I only grow death camas, not regular camas, because regular camas doesn't grow as well in my area as death camas. So there's no danger of me mistaking my death camas for regular camas. And I grow my death camas in a large pot so that Boston can't easily get at it. 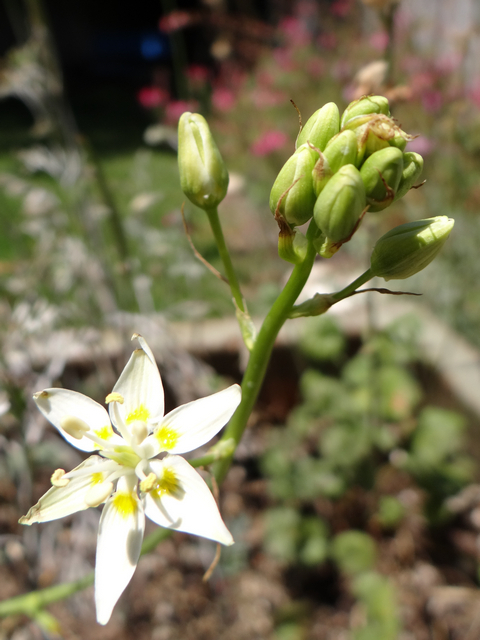 This was the first flower to open on the death camas. 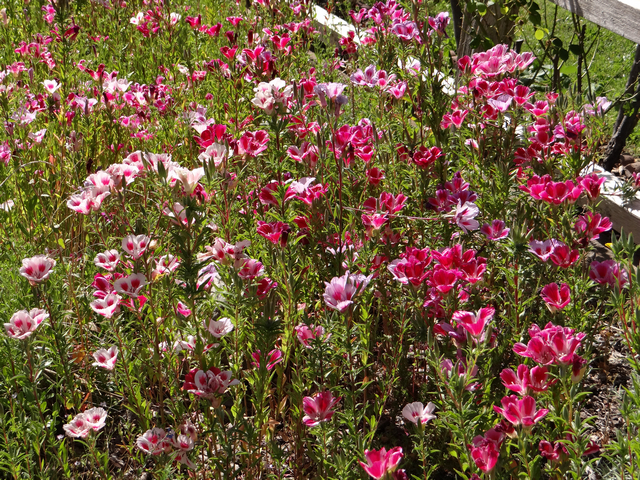 It blooms from the bottom up, with most of the flowers clustered at the top for a big finale. And then the whole thing starts going off! So that was death camas. Let's see, what else was new and exciting? California skullcap (Scutellaria californica) was a new plant for me this year. 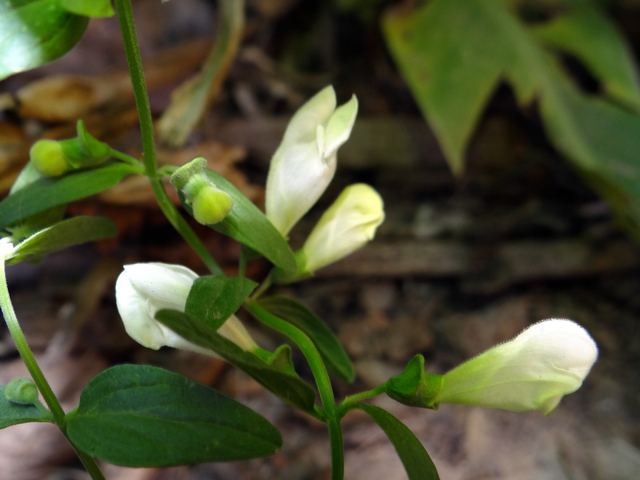 I've been wanting to grow skullcaps for years, but this isn't really the species I was hoping for - the ones that are more locally native to me have bluish-purple flowers, but I've been trying to find them for sale for years and they just don't seem to be available anywhere. This species is not so local to me and not so pretty either, but it's all I could find. I'm not sure it has survived the summer. It's looking rather terrible these days. 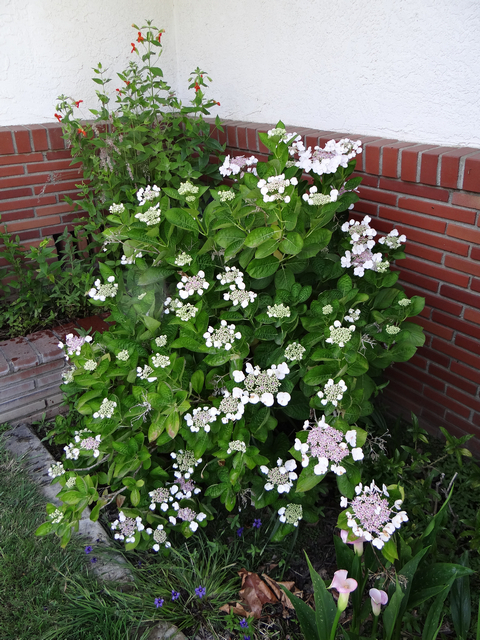 It didn't look spectacular in June either, but it did produce a few little white flowers. The Cedros Island vervain (Verbena lilacina 'De La Mina') is native to Cedros Island, off Baja California, but not to Alta California. It was new to me and turned out to be largely a flop for me; most of the plants froze to death over the winter, because they're simply not adapted to handle the weather as far north as this. 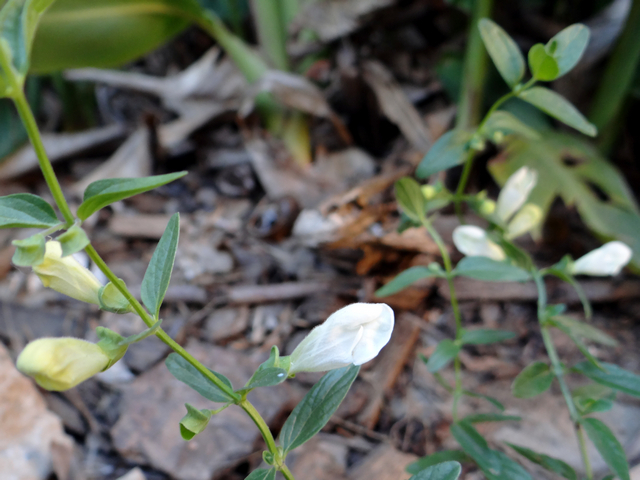 One plant did survive, however, and produced a few little flowers. 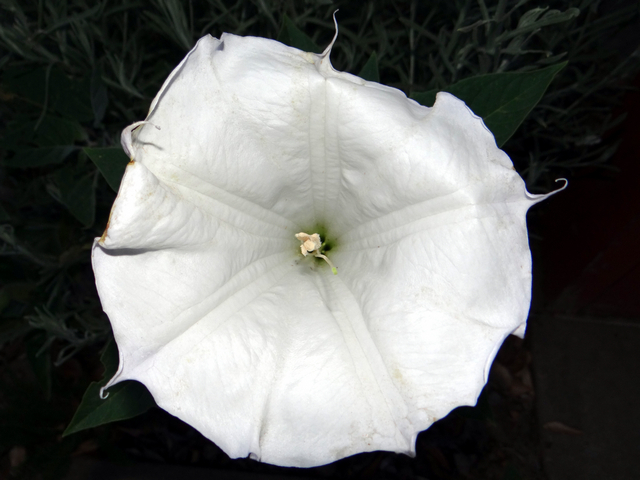 Sacred thornapple (Datura wrightii) was not new to me, but it feels a bit new to me since it's behaved very differently for me here than in my old garden. It also behaved very differently this summer than last summer! 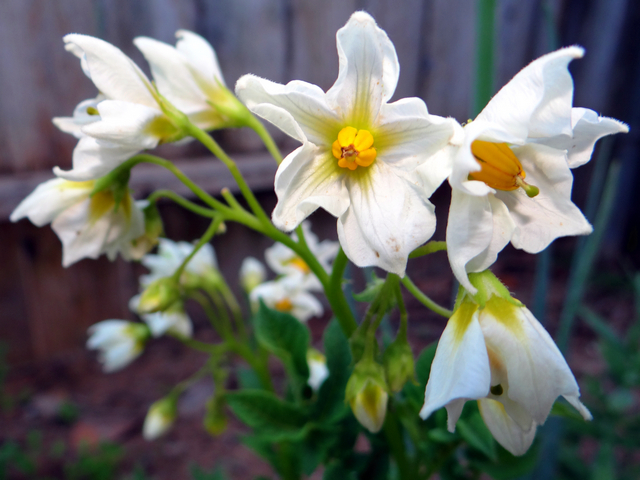 This summer it produced a few beautiful blooms like this one, but then I saw a three-lined potato beetle eating a few holes in it. I wasn't particularly concerned; this plant was a bit scary in its reproductive success last summer, so I figured that having a bug gnaw on it a bit would not be a bad thing. Well, the next thing I knew, the whole plant was dead! Pretty much overnight! I'm not entirely sure whether that was the beetle's fault; all I know is that I saw the beetle and then the whole plant died. 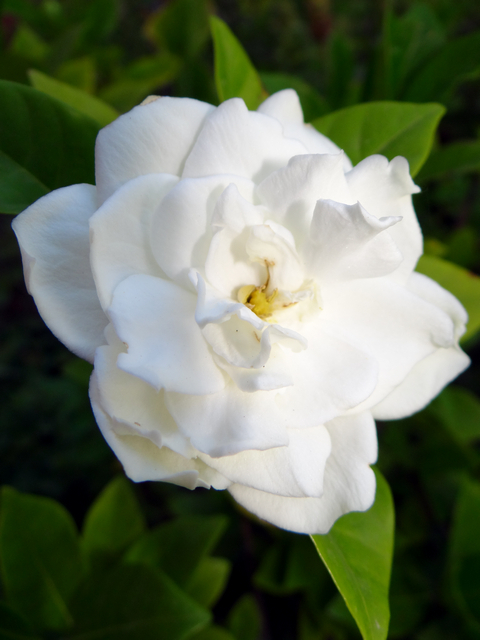 So, no more huge white flowers this year. 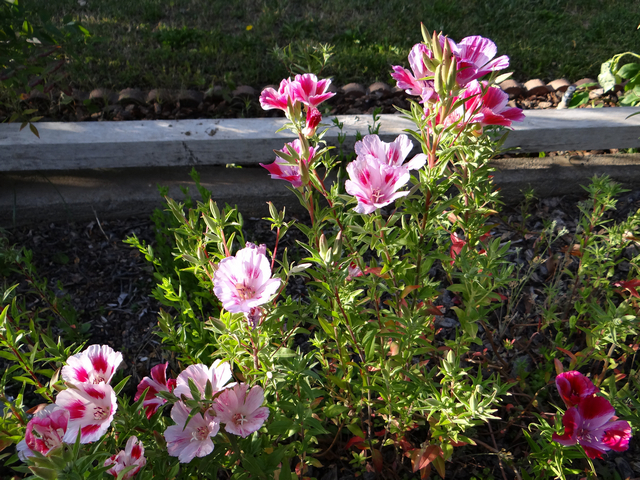 I should have more next year, though, because there's a seedling from the original plant still surviving within a foot of the original plant's location. And no sign of beetles on the seedling. 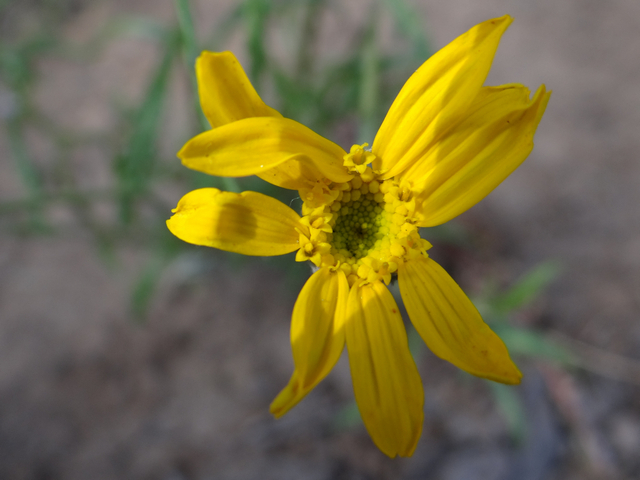 I also had a woolly sunflower (Eriophyllum lanatum) in my old garden, but I postponed planting one here because they're not especially pretty, really. 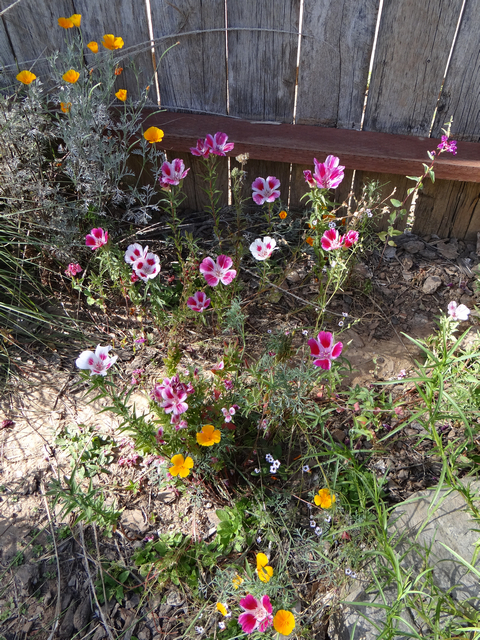 Eventually, though, I broke down and planted one anyway. It's not very big yet, but it's produced a few humble little flowers. 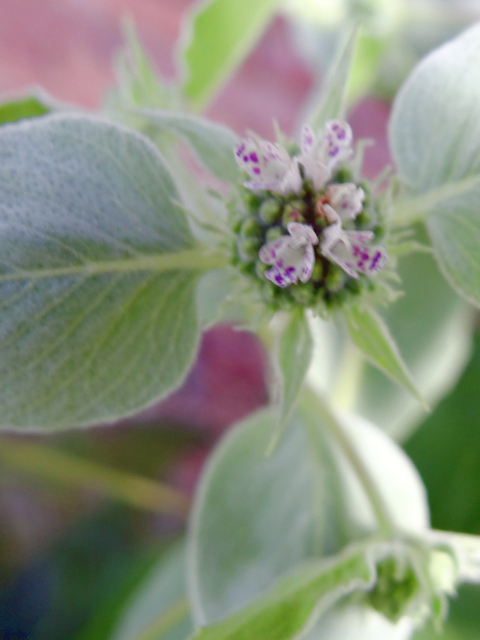 Sierra mint (Pycnanthemum californicum) produces nearly microscopically tiny flowers, but I adore the plant for its intermittently furry leaves (only the leaves produced in the heat of summer are gray-green and furry; the leaves produced in cooler months are bright green and smooth) and its powerful mint scent. The leaves are edible and can be used in the same way as other mint leaves. 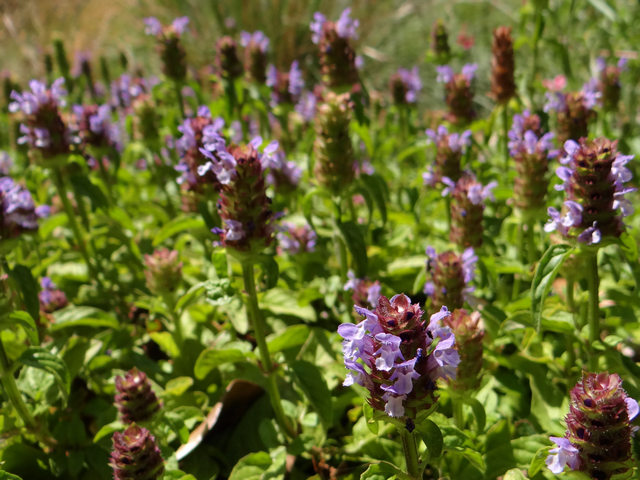 Self-heal (Prunella vulgaris) is both native and non-native, and in my garden, it's both a volunteer and also storebought. Apparently you can tell the difference between native and non-native strains of it by the leaf shape and the height of the flower spike, but I haven't bothered putting a lot of effort into distinguishing mine since I'm pretty sure I have a mixture of both. I'm very fond of this plant. 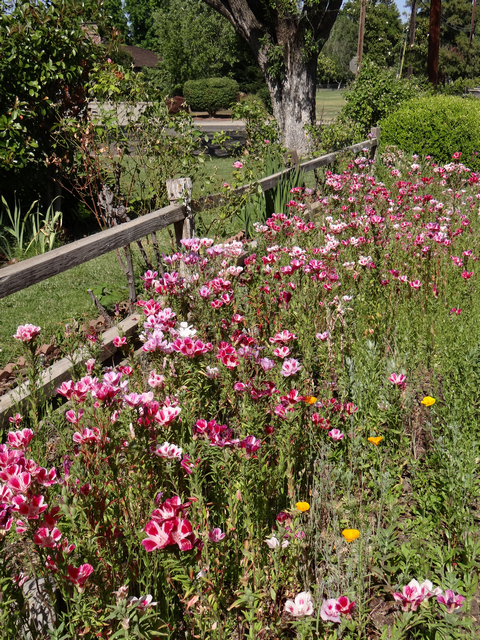 It fills in empty spaces very nicely but is short enough to coexist well with most other plants, and when I occasionally do want to remove it, it's not very hard to remove. Also, it likes both shade and sun! I guess it doesn't like the very hottest sun, but I have a lot of shade, actually, so this plant is happy in most of my yard. Scarlet monkeyflower (Mimulus cardinalis) is a native riparian plant that needs a whole lot of water but also good drainage. I had it in a pot in my front yard for most of this summer, until I forgot to water it for two days and it never recovered. Well, it was nice while it lasted. I've since bought a new one and put it in a different location where I don't think forgetfulness on my part will kill it quite as fast. 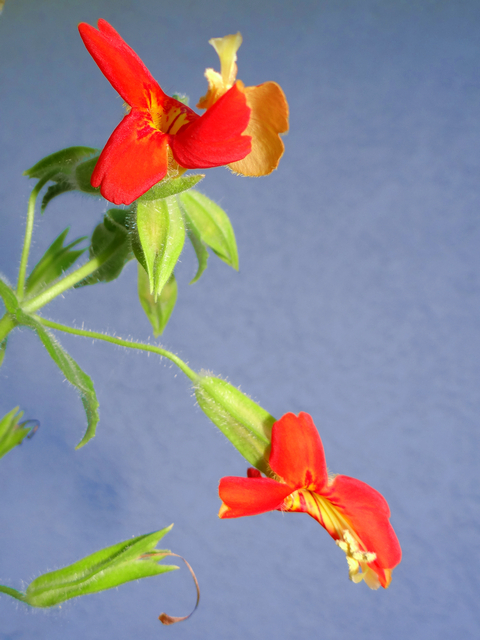 You can also see the scarlet monkeyflower in the background of the pictures below. (There's a big blue ceramic pot back there, I swear! You just can't see it at all from this angle.) 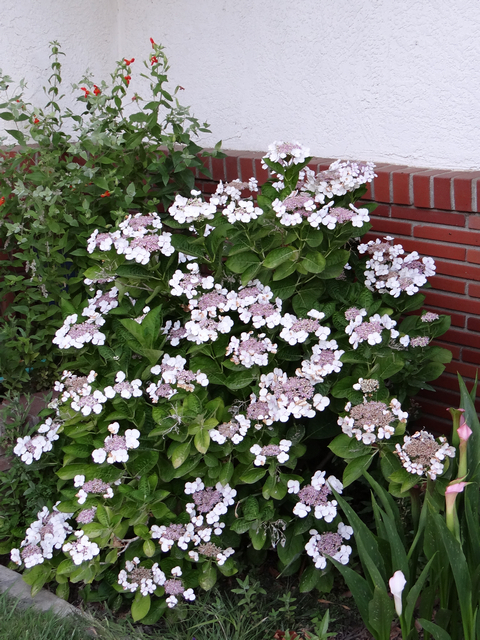 In front of the monkeyflower is a bigleaf hydrangea (Hydrangea macrophylla). 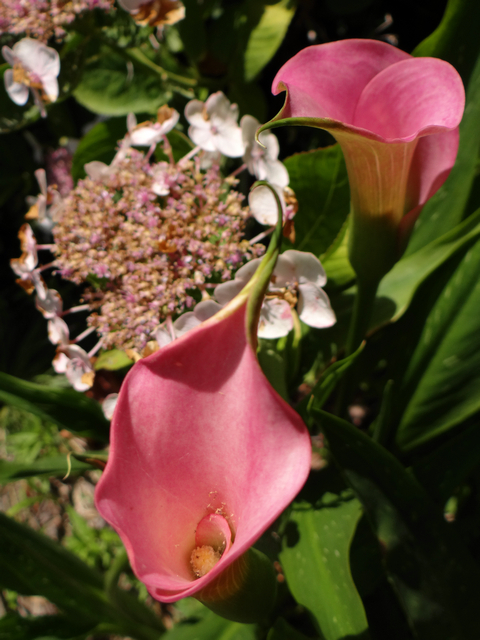 To the right of the bigleaf hydranea in the pictures above, you can see a pink Calla lily (Zantedeschia rehmannii). 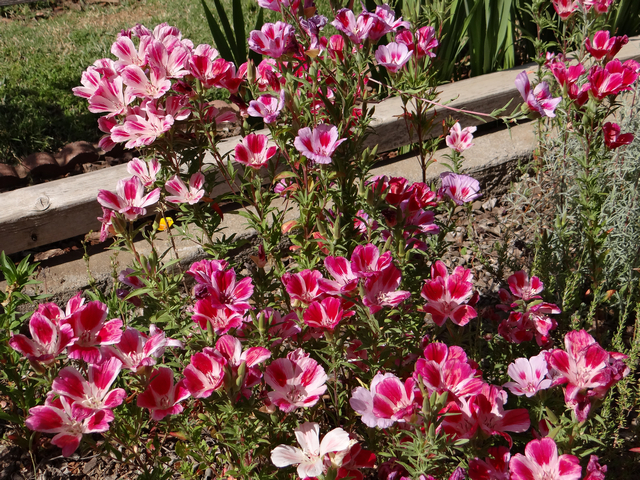 This is a closeup of those flowers. 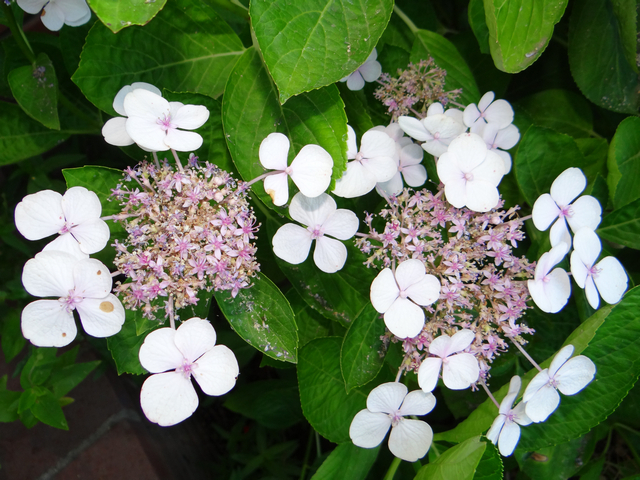 This is a closeup of the bigleaf hydrangea flowers. 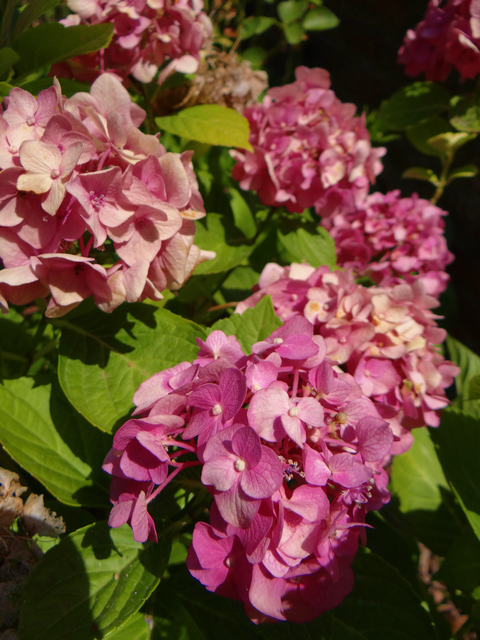 And here is a different cultivar of bigleaf hydrangea. 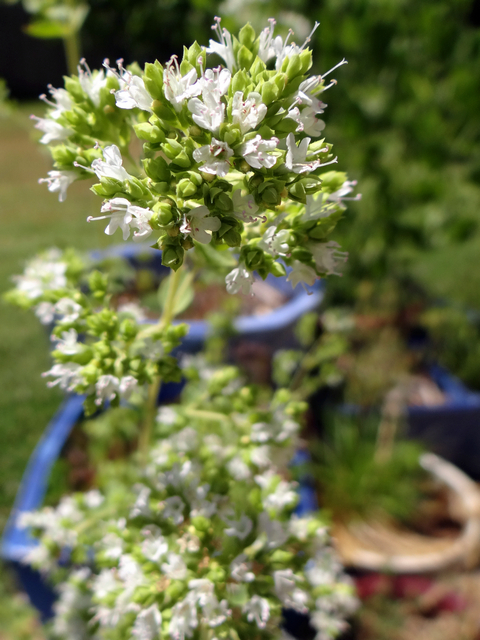 All my oregano (Origanum vulgare) started blooming in June. Some is in pots and some is in the ground. Some blooms in white and some in purple. 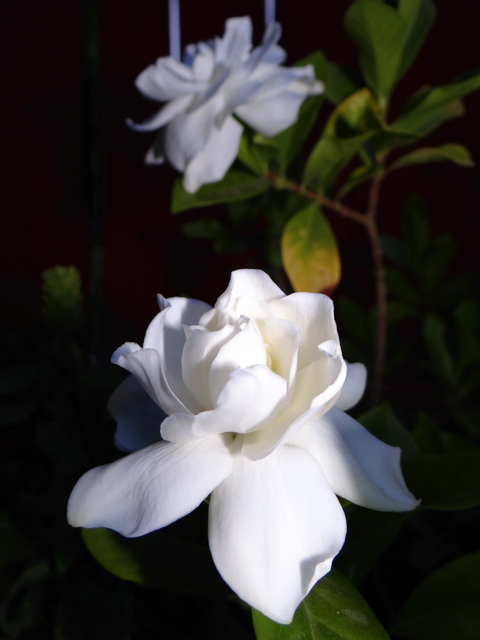 But all of it bloomed profusely, all summer long. When herbs and vegetables bloom, it's generally supposed to be upsetting, because it tends to make them taste bad. I don't mind, though. 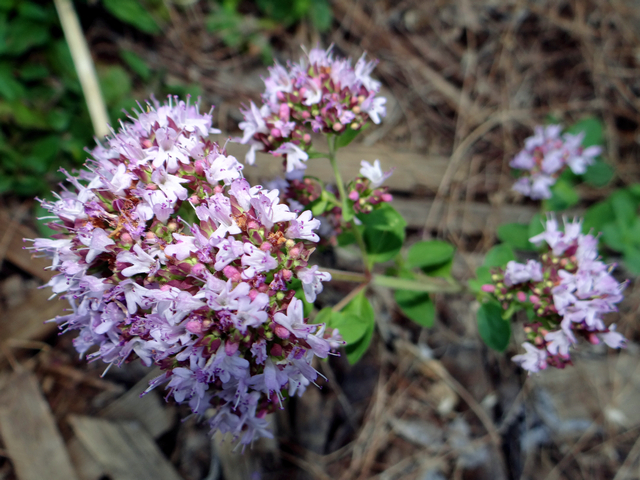 I don't use enough oregano in cooking for it to be worth caring about, and the flowers are pretty. 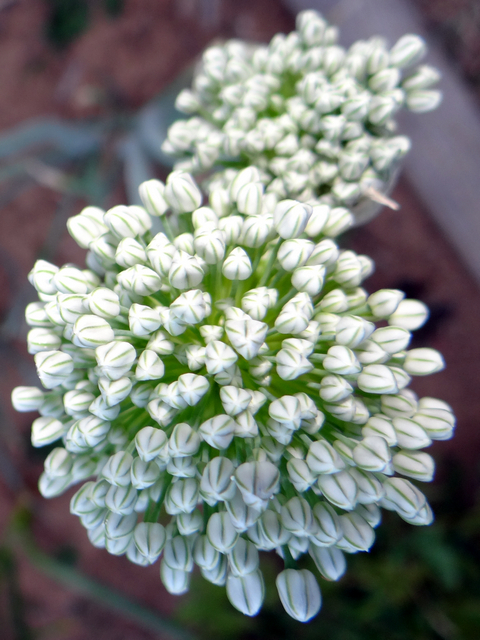 Here are some leeks (Allium porrum) budding in my food garden. 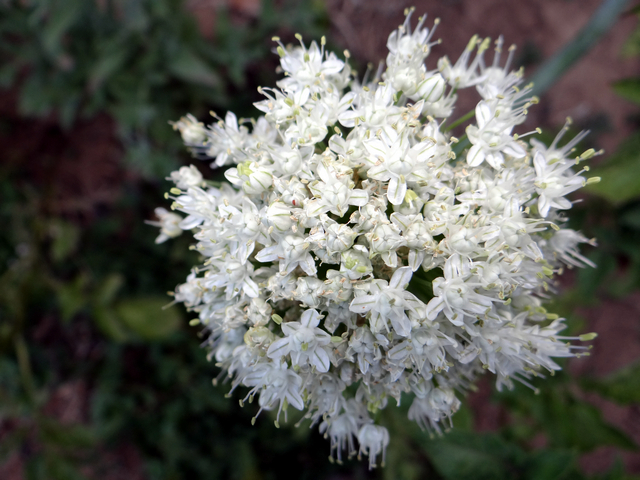 And here is a leek in full bloom. 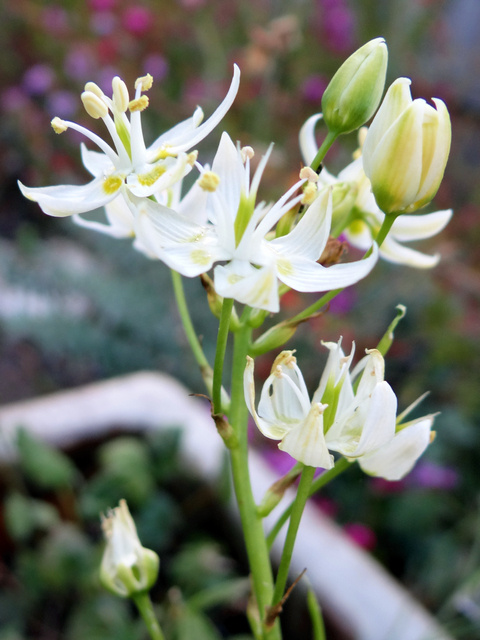 I don't even much like to eat leeks, but who wouldn't enjoy these flowers? 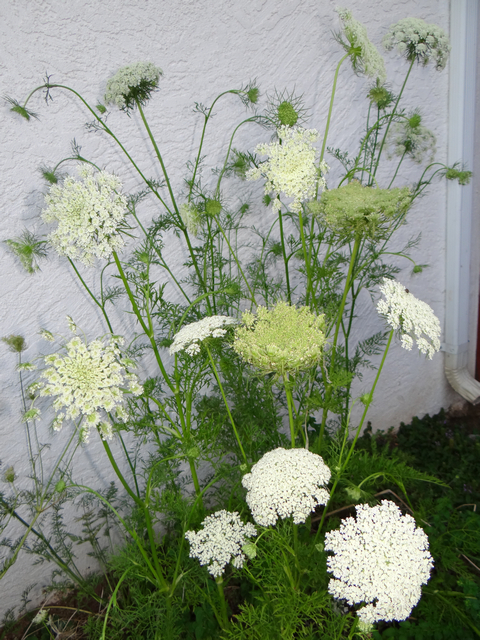 And then there are the carrots (Daucus carota). I mostly only eat them in carrot cake. Sometimes I drink them as carrot juice. The flowers are rather nice, though. Also, potatoes (Solanum tuberosum)! I do like to eat potatoes. I'm very bad at figuring out when to dig them up, though. I tend to just never get around to it, so I grow tons of potatoes but go on only eating the ones I buy at the store. This is a silly arrangement that will surely have to end at some point. One day, I'll have so many potatoes in my garden that I'll feel a need to start digging them up just to get rid of some. Then I'll start learning to eat homegrown potatoes rather than storebought ones. 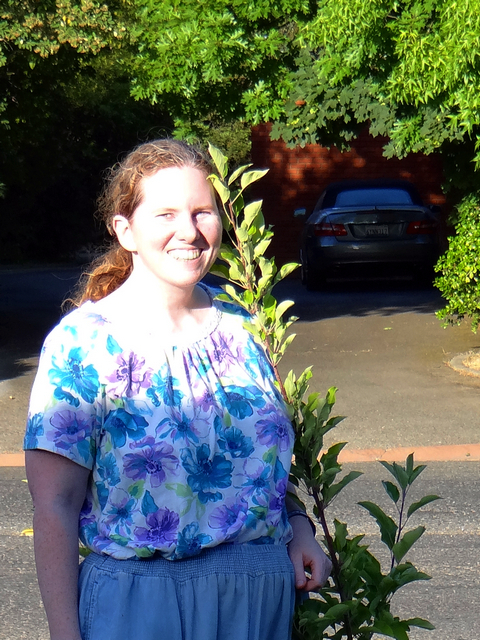 This is a strange picture of me, since half my face and one of my eyes have sort of vanished in the glare of the sun, but I was trying to commemorate an important gardening milestone: my Gala apple tree in the front yard was just as tall as me! And at more or less the same moment, my valley oak in the back yard was also just as tall as me. There was no good location to set up my camera near the valley oak, so I only commemorated the apple tree. They're both now slightly taller than me. 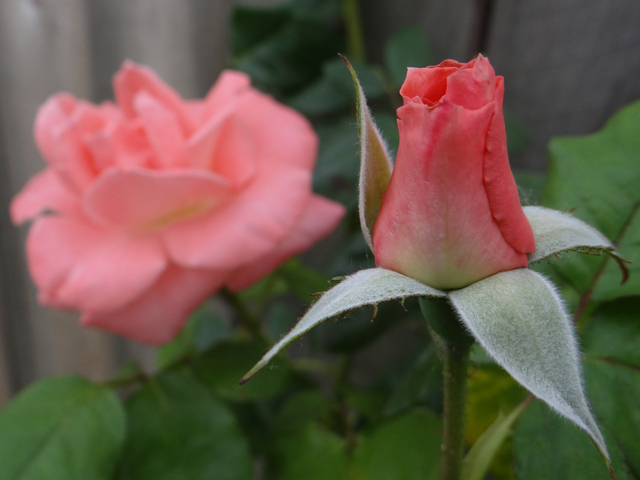 As a transition from edible non-natives to ornamental non-natives, here are some roses. On with the ornamentals! 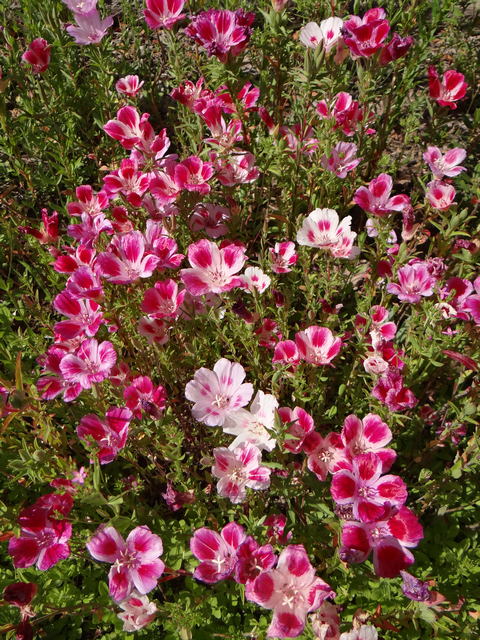 This is an azalea of some sort. 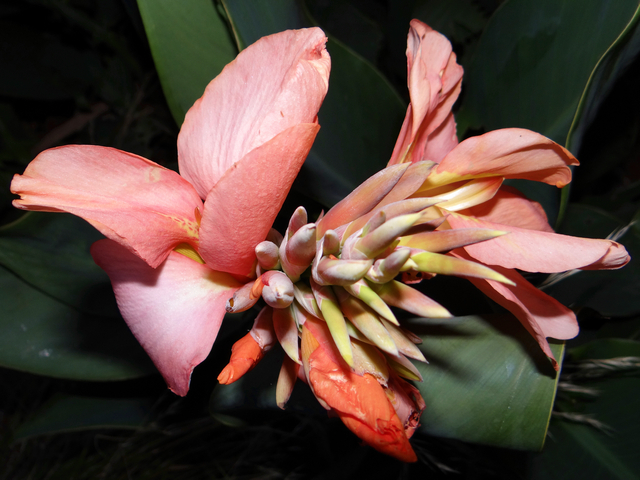 This is a Canna lily (possibly Canna indica 'Alberich'). 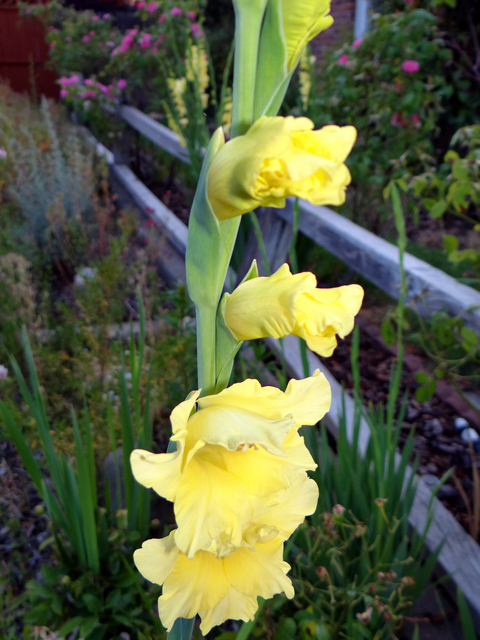 And this is a hybrid gladiolus (Gladiolus hybridus). And now we're approaching the big finale of this post. But let's ease into it slowly. 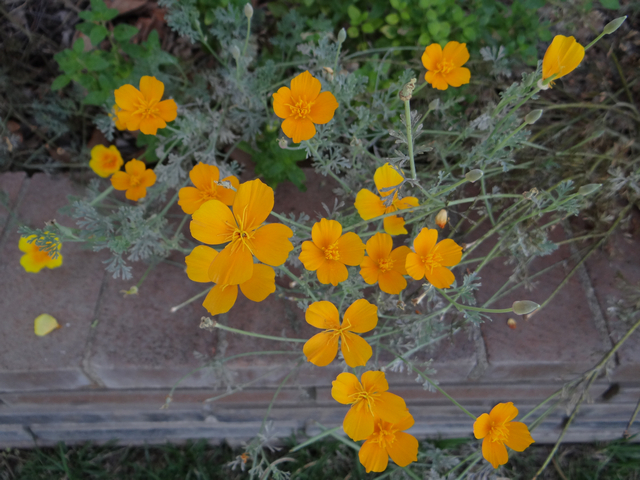 Here, have some California poppies (Eschscholzia californica). They seem to have smaller petals in June than in April and May. 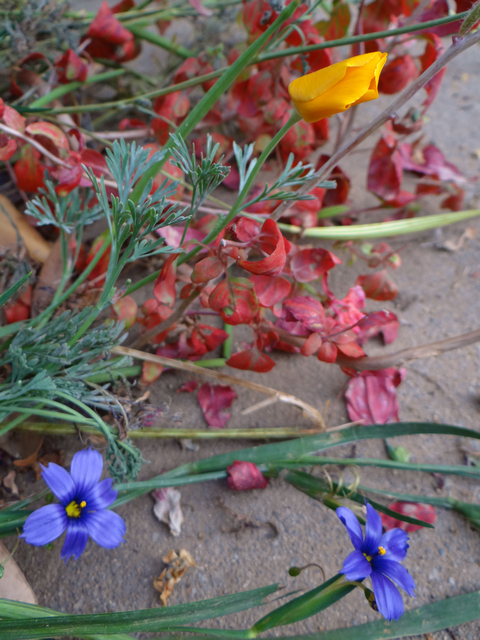 Here's another California poppy, along with some blue-eyed grass (Sisyrinchium bellum 'North Coast'). And those striking red leaves, what are those? 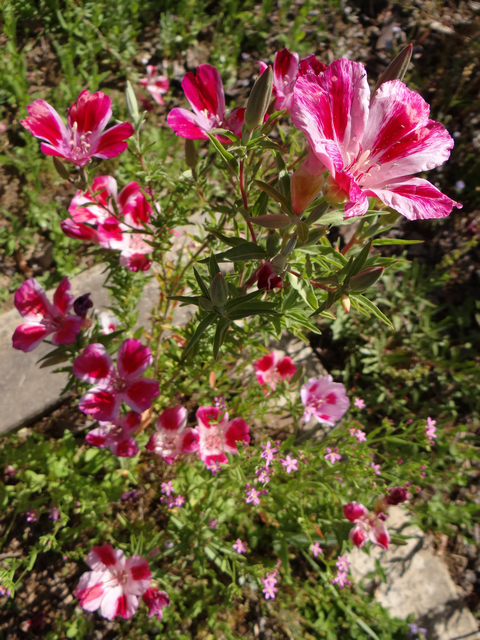 Those are the remains of a dying farewell-to-spring (Clarkia amoena) plant. 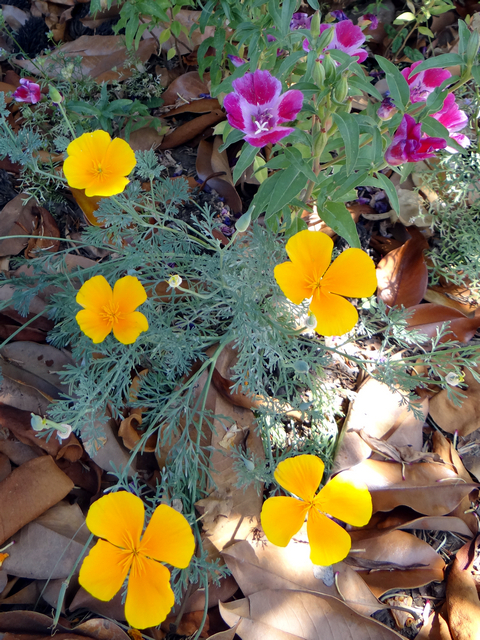 Here are some farewell-to-spring flowers along with some California poppies. 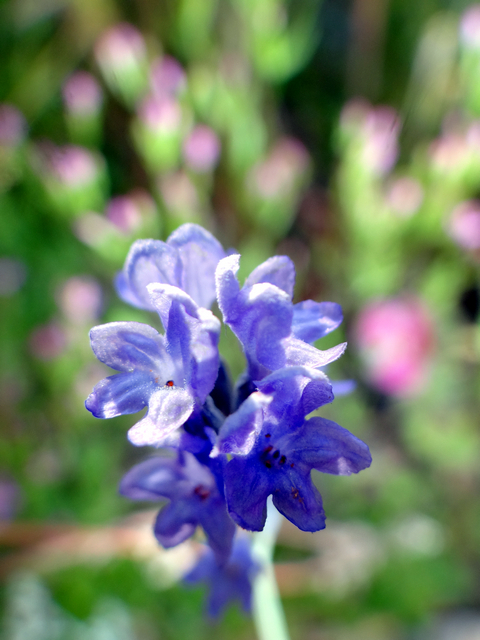 The farewell-to-spring was pretty much the highlight of the entire year in my garden. I know it might not seem that impressive from a few pictures showing little drifts of it here and there. Because it just does not stop. Are you done saying farewell to spring yet? Good, because in less than a week now, we'll be saying farewell to summer. Which doesn't bring quite such impressive explosions of pink. Though I do have a pretty good show of bright red California fuchsias going on now. Which you'll get to see at whatever point I eventually get around to posting those pictures. Hopefully soon.